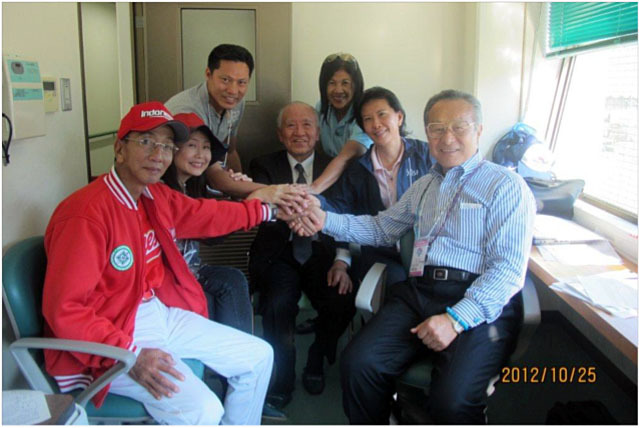 Kazuhiro Tawa, 1st Vice President of IBAF and Executive Director of BFJ, paid a visit to Niimi City, Okayama Prefecture on October 25, 2012 as a guest to the 9th Asian Men’s Softball Championship participated by 6 teams across Asia: Hong Kong, India, Indonesia, Philippines, Singapore and Japan. He caught up with Dato’ã€€Beng Choo Low (Malaysia), President of Softball Confederation of Asia and Secretary General, International Softball Federation, Dr. Yukitaka Ishibashi, VP Japan Softball Association and the other officials including Jeffeury Tan, President Singapore Baseball & Softball Association, Gugun Yudinar, President, Indonesian Baseball & Softball Federation. On October 15, 2012, BAF and ISF have announced the signing of a Memorandum of Understanding (MoU) outlining the procedure for establishing a new international federation (IF) to govern both baseball and softball exclusively, as created by the ISF and the IBAF, an important step towards our collective efforts to reinstate our sports in the Olympic Programme in 2020.